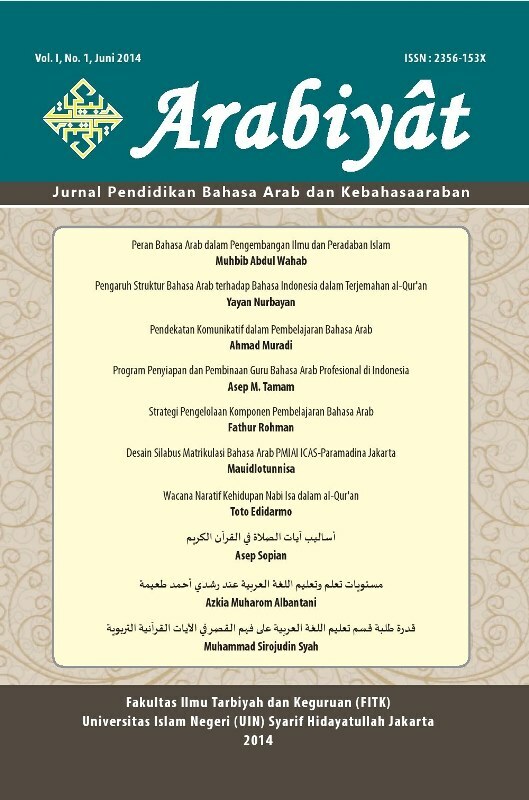 Arabiyat : Jurnal Pendidikan Bahasa Arab dan Kebahasaaraban published twice a year since 2014 (June and December), is a multilingual (Bahasa, Arabic, and English), peer-reviewed journal, and specializes in Arabic Education. This journal is published by the Arabic Education Department, Faculty of Education and Teachers Training, Syarif Hidayatullah State Islamic University of Jakarta, in partnership with IMLA (Association of Arabic Lecturers). Click Here to Download MoU. Editors welcome scholars, researchers and practitioners of Arabic Education around the world to submit scholarly articles to be published through this journal. All articles will be reviewed by experts before accepted for publication. Each author is solely responsible for the content of published articles. Arabiyat is accredited by Ministry of Research, Technology, and Higher Education Republic of Indonesia No. 51/E/KPT/2017 on December 4, 2017 (Amendment of No. 48a/KPT/2017 on October 30, 2017) (Valid until October 30, 2022). Arabiyat has become a CrossRef Member since year 2015. Therefore, all articles published by Arabiyat will have unique DOI number. Arabiyat is calling papers for the issue of Vol. 4, No. 2, December 2017. If you have unpublished manuscripts that might fit within our subject areas, please consider submitting to the journal.